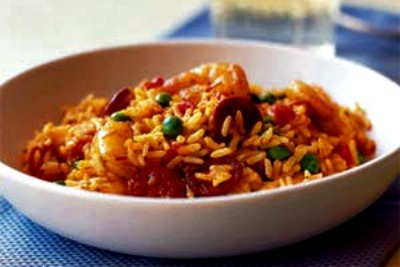 Another recipe that uses a nontraditional paella method - the pressure cooker - to produce a meal quickly in an emergency. 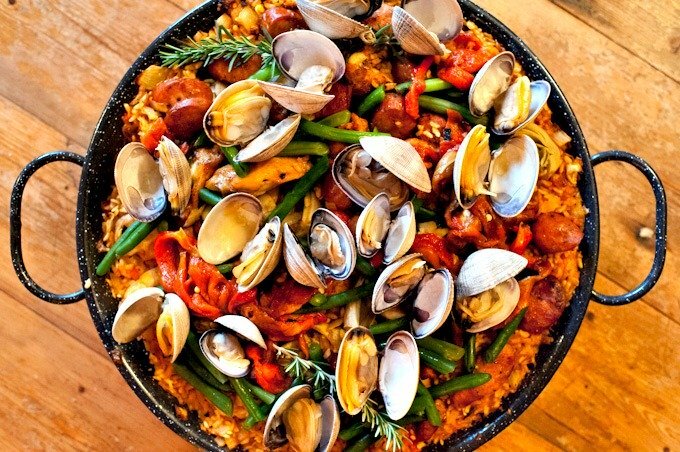 The guests that "just happened to drop by" will never guess that this flavorful paella was prepared in under 15 minutes! Although not as elaborate as some of its more traditionally prepared cousins, this paella nevertheless yields surprisingly good returns for the scant effort invested, and is a perfect choice for when you are simply too tired or busy to cook. In a pressure cooker, sauté the onion and pepper in the olive oil until the onion is tender. Add the tomato and cook for a further 5 minutes. Add the rice and sauté until translucent. Pour in the broth, shrimp, saffron, cumin, and pepper, close the pressure cooker, bring to high pressure over medium heat, and cook for a further 3 minutes. Transfer to a paella pan or serving platter, garnish with lemon wedges, and serve.